In case I had no proof of my insanity, well tonight put all doubts to rest. 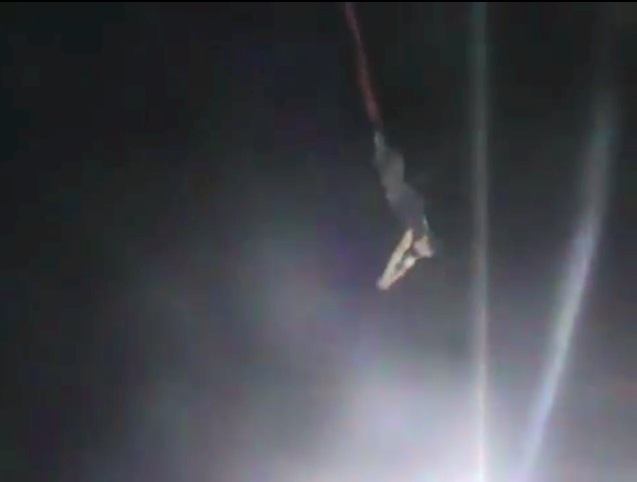 I did a 130 ft. bungee jump. But tonight I was feeling rather reckless. I was at the LA County Fair with some friends and watched with disbelief as people leapt from the steel cage suspended by a crane, way up 130 feet in the air, screaming with delight at the sheer terror of the free fall. When they seemed ready to splatter on the pavement below, the thick bungee cord would take over and with vicious recoil send them hurtling back up around 20 to 30 feet so that they would fall again. My disbelief turned to interest, and my interest turned to recklessness. The jump was $40 and if you wanted DVD proof of your exploits (which I did) that was another $15. I paid for the jump and my awesome friends paid for the DVD. I won’t lie, my hands were shaking as I filled out all the waiver forms. After paying and signing all my rights away, I removed my shoes, and then a girl came and harnessed me up. I had some waist harness sort of like what rock climbers use plus two ankle braces that would connect to the bungee cord. After suiting me up, she checked and tightened all the straps several times over, but as I stood in line, I fidgeted with the straps – tightening and re-tightening. It seemed like forever while I waited for my turn and the longer I waited the more nervous I became. I knew I would have no problem riding up 130 feet but I knew I would have trouble actually jumping. My friends screamed their support for me as I stood in the little cage and had the bungee cord attached to me. I crossed my fingers as the steel cage rode up and up and up and up, I looked down at the disappearing ground and slowly began to realize how high up I was. Suddenly the steel cage stopped, and the little door was opened. I stepped out onto the platform but my hands had a death-grip on the handles. I turned to the trainer and told him to push me if I didn’t jump after the count. In my head I heard, “Three. Two. One. Jump!”. But nope, there was no jump in me. Then I felt the hand on my back pushing and with a muttered expletive, I jumped. Raw fear grabbed my chest as I simply fell with no restraint. In shock I watched as the pavement came racing up to catch me. Then I freaked out and closed my eyes, waiting for the kiss of death. But a split second later, the bungee cord became my savior, throwing me back up in the air like a rag doll. The recoil was jarring. It felt as if my stomach was just shoved into my chest. This time I laughed because I knew the bungee would catch me. After several bounces and swinging like a pendulum, I finally landed on the big air tent, then was caught by the assistants who sat me down in a chair. My whole body was shaking with the exhilaration, and yet I was proud. Proud, because I had finally done something absolutely reckless (in my opinion). I had faced a fear. I had disdained common sense and lived. I have no clue what got into my head and persuaded me to bungee jump but it was the superlative of “cool”. I will never jump again. But I can relive the jump every time I look at the video and that is plenty for me. As Rihanna said, “Cheers to a freakin’ weekend”.